Full set replacement with dental implants may be considered if you have no teeth or deteriorated dentition from conditions such as gum disease, tooth decay, heavy wearing down or erosion, multiple failed root treatments, maloclussion (bite imbalance) and/or multiple missing teeth. Dental implantsare titanium fixtures that can be used as anchors to support upper and/or lower full set replacements. If you wear a denture, or have deterioration and want to avoid wearing a plate, our ‘All-On-4 Plus’ treatment concept may offer a permanent solution and a fixed alternative to loose dentures. We are committed to providing a high standard of care by using advanced techniques and as little as four teeth implants to support a fixed replacement bridges that is aimed to look, feel and function like beautiful natural teeth. Our facilities are purpose-built with everything that is required to achieve not only high aesthetics and more natural functionality, but also immediate results. That means that we can achieve a complete smile makeover with full set replacement with teeth implants in as little as 1 to 3 days. Patients seek alternatives to dentures with permanent teeth implants because of the problems that are known to be associated with dentures such as looseness, pain or discomfort from the denture rubbing on the gums or pressing on nerves, inability to bite or chew food efficiently, reduced ability to taste food and wine from the plastic extensions that often cover the taste buds, and poor facial aesthetics. Dental implants can reliably support fixed replacement bridges and alleviate or avoid the problems that are often seen with dentures. Thus in many cases, this procedure may offer a significant improvement to quality of life. For a review of your oral health and for more information on All-On-4 Plus, book an appointment at CAID today on (03) 8845 5400 or via an online contact form. Click to view the latest edition of our popular publication on the permanent alternative to dentures or deteriorated teeth ..a must read. What is All on 4 Plus? 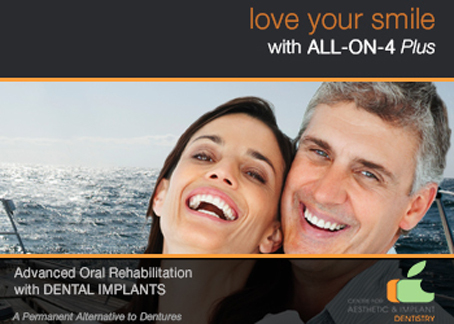 Watch an interview with Dr Alex Fibishenko about All on 4 Plus dental implant technology.